Imagine being young and in love… with a brand new 1972 Corvette Stingray; your first and ultimate “dream car.” Now imagine that your beloved Stingray is stolen, and police tell you that it’s probably been stripped for parts and dumped in a river. 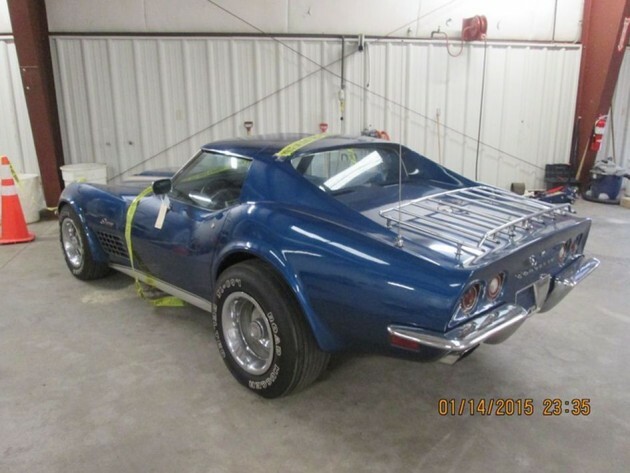 Now imagine that 42 years later, someone actually finds your long lost ’72 Corvette! And now imagine that even though it’s been found, there’s a good chance you won’t be getting it back after all. A bit of an emotional roller coaster, no? As Terry explains, her missing blue T-top Stingray was discovered by a local used car dealer who bought the ‘Vette after its owner passed away. When he noticed the mismatched VINs, the man contacted police, who contacted Terry. Unfortunately, neither Terry nor her insurance company, Allstate, can find the car’s title. And even if they could, Allstate paid the claim for the stolen vehicle back in 1972, making the insurance company the actual owners of the Corvette. It would be pretty awesome. Unfortunately, this story might not have an awesome ending.